Three of four third party presidential candidates used a Tuesday night debate to come out in favor of marijuana legalization and to criticize drug prohibition in general. Neither the topic of marijuana legalization nor the larger topic of the war on drugs was mentioned in the three separate debates between President Obama and Republican challenger Mitt Romney. 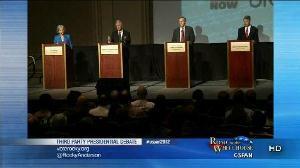 Third party candidates were excluded from those debates. Unlike the major party presidential debates, which were carried live by multiple mainstream media outlets, the debate sponsored by the Free and Equal Elections Foundation suffered a virtually media blackout in the US, but was broadcast by Russia-based RT TV and Al Jazeera News. "We don't need to just legalize marijuana in this country, we need to end drug prohibition just as we did alcohol Prohibition, and treat drug use and abuse as a public health and educational issue and get it completely out of the criminal justice system," said former Salt Lake City mayor Rocky Anderson, presidential candidate for the Justice Party. "I'm not for legalizing drugs. If you want that, vote for one of them. Don’t vote for me," said independent candidate Virgil Goode, a former Virginia Republican congressman. Goode added that federal funding for the war on drugs should be reduced and that enforcement should primarily be a state issue. He then went on to suggest other areas of federal funding that he would like to see reduced, leaving moderator Larry King to remind him to stick to the topic at hand. "We're on drugs. We're on drugs," King said. Libertarian candidate Gary Johnson followed Goode, and there were no surprises from the long-time advocate of legalization. "Let's legalize marijuana now -- and right now in this country, we are on a tipping point on this issue," he said to enthusiastic cheers. He added that he is not "advocating drug use," but rather acknowledging that it is an "issue that belongs with families, not in the criminal justice system." "I am not a hypocrite on this issue," Johnson said. "I have drank alcohol, I have smoked marijuana… In no category is marijuana more dangerous than alcohol. And yet we are arresting 1.8 million people a year in this country on drug-related crime." Last up was Green Party candidate Jill Stein, who drew on her career as a doctor to challenge the war on drugs. "Marijuana is a substance that is dangerous because it’s illegal," Stein said. "It's not illegal on account of being dangerous, because it's not dangerous at all." The Free and Equal Election Foundation will hold another debate on October 30. It asked viewers to rank the four candidates in order of preference, with the top two vote-getters moving on to the final debate, but no results have been announced yet. The war on drugs, like all the other current wars is unsustainable. As people high on marihuana are only a danger to donuts and it is a healthful substance for victims of cancer and aides it is ridiculous that our current police state victimizes citizens with arrest. The fact that over one million arrests are made every year speaks to the cost to taxpayers as well as to society. I agree with Gary Johnson. This is an unsustainable costly war. Prohibition did not work before and is not working now. Gary Johnson has my vote. Only TWO comments on this article? Come ON, people, pay attention, these are the best candidates, Romney and Obama are the worst candidates. Next 3rd party debate will be held in DC on 10/30 and will include only Gary Johnson and Jill Stein, watch and vote for one of them instead of for either one of the Goldman Sachs twins (neither of which will ever make a move to legalize marijuana, let alone end prohibition completely for all drugs). Thanks for having the third party debates and thanks to all for answering the legalization question honestly. Gary Johnson has my vote (he would if I didn't live in Oklahoma). Neither O nor R will get my vote. Marijuana is also good to smoke if you have the flu, at least it was for me, so I'm speaking from experience. No longer can the government call marijuana 'the gateway drug'. I believe the gateway drug now is ritalin. It is easier for a 6 year old to be prescribed ritalin than it is for an adult to use marijuana. Also a country that proclaims freedom of the press, and freedom of speech, should have jumped at the chance to have these candidates debate, and to spread the word and their ideas. It's a sad day that our news is broadcast from a station from another country. I heard more about the unfair Iranian elections than I ever heard about our other candidates or how unfair this election has become. 'the Goldman Sachs twins' i like that, moonrider. they're a.k.a. tweedle dee and tweedle dumb. THIS IS FREAKING CHONT! JUST KIDDING I HAVEN'T EVEN READ IT!!!! They don't even consider us citizens anymore, we are now nothing more than consumers. MaryJ.